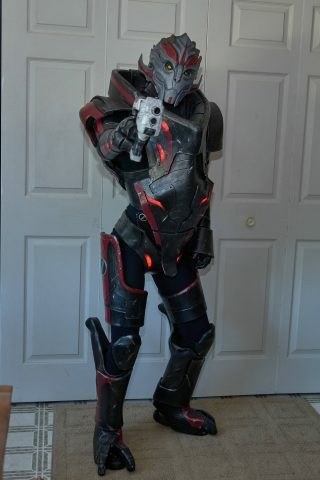 Mass Effect Turian Costume with an EVA Foam Mask « Adafruit Industries – Makers, hackers, artists, designers and engineers! The mask is eva foam carved with a dremel tool. The head piece is a fabric hood with foam scales. I spread hot glue on the fabric to make it look more like skin and then painted it. the mouthpiece is separate (it moves with my jaw) and air comes in through the eye mesh too. It’s actually really easy to breathe in. The combination of the hood and foam mask means she doesn’t have to wear a pullover prosthetic, which has to be way more comfortable.